This summer the Met Office was able to take advantage of a nanosatellite being used as a technology demonstrator by the European Space Agency (ESA) to gather weather information. The satellite, GomX-3, was built by the Danish CubeSat developer GomSpace. Using technology not tested in this way before, our scientists were able to use this satellite to gather wind and temperature observations over a large part of the globe. 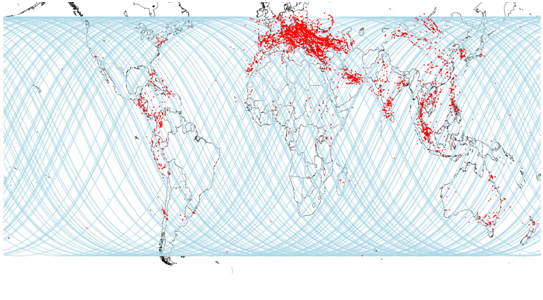 The data was collected from messages sent routinely from aircraft back to Air Traffic Control. This experiment has proven that by exploiting existing technology in new ways it is possible to obtain weather data for locations which may be data sparse. In the future this data could be fed into numerical weather models to help improve the accuracy of weather forecasts. The ESA technology demonstrator, GomX-3, was designed to collect Automatic Data Surveillance – Broadcast (ADS-B) messages to track aircraft from space using a nanosatellite. Collaboratively GomSpace, ESA and the Met Office agreed on an extended mission which would involve reprogramming GomX-3 whilst it was in orbit around the Earth to collect additional parameters required to calculate wind and temperature observations. These are called Mode-S Enhanced Surveillance (EHS) parameters. The reprogramming was successful and data was collected for two weeks over a large part of the globe. The locations of all of these derived observations are shown below as the red dots. The blue lines show the track of the satellite during this period. The Met Office has been investigating this aircraft derived data method since 2011. Mode-S EHS is used by Air Traffic Management to obtain situation information from aircraft. This data combined with the position ADS-B data allows wind and temperature to be calculated at the location of the aircraft. There are currently 6 ground based receivers located throughout the UK and Channel Islands collecting the data and deriving up to 6.8 million observations of wind and temperature per day from aircraft in flight across UK airspace. This is an increase from just 10000 aircraft observations over the UK per day! A large part of the work over the last 5 years has been around understanding the quality of the observations. Comparisons to our high resolution operational model have been conducted on every model run since 2013. We’ve also made use of the Facility for Airborne Atmospheric Measurements and compared the observations to those made by the research grade instrumentation on the aircraft. The quality of the wind observations has been found to be comparable to more traditionally sourced aircraft data, while the temperature information requires some additional manipulation. The increasing number of observations is important to drive the mathematical models used in weather forecasting. The resolution of the models is ever increasing; over the UK the Met Office now uses a model with a grid spacing of 1.5km, everyday this model uses around 250,000 upper air wind observations. This data is used to nudge the model of the atmosphere closer to what is being measured, ultimately leading to improvements in the forecast. To keep pace with improvements in models, novel methods of gathering observations must be used like those explored in this mission. Edmund Stone, Observation Scientist at the Met Office said: “This information will be useful in the future in increasing the global observation network coverage, both from the ground and also from orbit. The project has also shown that it is feasible to use small, relatively low cost satellites for the collection of data for atmospheric measurement”. These results have changed our view of data availability, demonstrating that there is Mode-S EHS/ADS-B data available from significant areas, including data from every continent (excluding Antarctica). It is estimated that there is in excess of 100,000,000 observations available globally each day that are currently not being collected or used by the meteorology community. The challenge now comes in trying to harness this resource. This entry was posted in Met Office News and tagged CubeSat, European Space Agency, GomSpace, numerical weather models, observations, satellite, temperature, wind. Bookmark the permalink.